Dass Citroën auf eine lange Nutzfahrzeug-Geschichte zurückblickt und seit über 80 Jahren Anbieter von Transportern ist, beweist die Marke auf der IAA Nutzfahrzeuge 2012 in Hannover mit einem ganz besonderen Ausstellungsfahrzeug: Citroën präsentiert auf Basis des U23 einen historischen Bus aus dem Jahre 1947, der nach umfangreichen Restaurationsarbeiten in neuem Glanz erstrahlt. Der sehr einfach ausgestattete Citroën Bus ist 6,50 Meter lang und 1,96 Meter breit und bietet trotz seiner kompakten Ausmaße bis zu zwanzig Personen Platz. 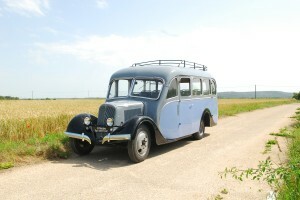 Das Kuriose: Ein Tourist, selbst Besitzer eines Citroën U23 aus dem Jahr 1947, hatte den exakt gleich aussehenden Citroën Bus 2005 während eines Korsika-Urlaubs zwischen wuchernden Sträuchern und Pflanzen auf einer Wiese entdeckt. 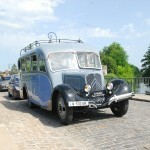 Die Amicale Citroën France, ein Verein, der sich dem historischen Erbe von Automobiles Citroën verschrieben hat, war gerade auf der Suche nach einem historischen Bus und wurde so mit diesem Citroën U23 fündig. Ein Konstrukteur nahm die Herausforderung an, den stark in Mitleidenschaft gezogenen Citroën Bus zu restaurieren und präsentierte die Fortschritte jedes Jahr auf der Rétromobile in Paris. 2012 schließlich wurde erstmalig der komplett restaurierte grau- und malvenfarbene Citroën U23 den Besuchern der Rétromobile vorgestellt. Nun werden auch die Besucher der IAA Nutzfahrzeuge in Hannover den ganz besonderen Citroën Oldtimer in Augenschein nehmen können. Auf einem Flatscreen sind die Stationen der Restaurierung – vom sensationellen Fund in Korsika bis heute – dokumentiert. NB Amicale: So fand man ihn in Korsika – Bilder von Imageshack. Die IAA Nutzfahrzeuge findet vom 20.-27.9.2012 in Hannover statt. 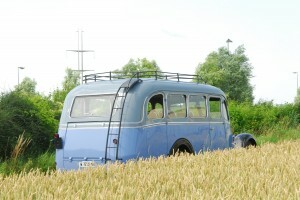 From September 20-29, 2012 the IAA Commercial Vehicles will take place in Hanover. The IAA Commercial Vehicles is the world’s leading trade fair for mobility, transportation and logistics. Its comprehensive innovations, exhibitors from several industries, discus- sions and, last but not least, the expert visitor structure represent a unique profile. 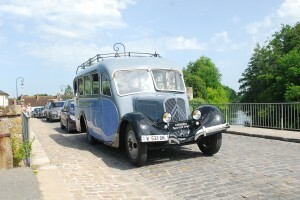 Citroën has a long commercial vehicle history for more than 80 years. 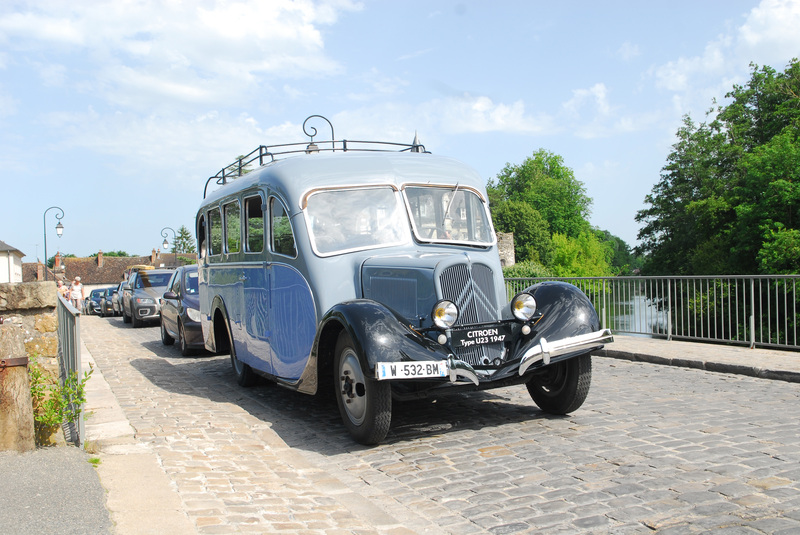 This year it is demonstrated by the brand at the IAA Commercial Vehicles 2012 in Hanover with a very special vehicle: Citroën presents on the basis of the U23 a historic bus built in 1947 which now after extensive restoration work shines again in its new splendor. The Citroën bus is 6.50 meters long and 1.96 meters wide and allows despite of its limited dimensions seating capabilities for up to twenty people. The interesting story behind: a tourist, himself owning a Citroën U23 from 1947, had discovered the exact same looking Citroën bus in 2005 during a holiday in Corsica between sprawling shrubs and plants in a meadow. A coachbuilder accepted the challenge to restore the Citroën bus which was rather in a poor condition, and presented the progress made each year at the Rétromobile in Paris. Finally, in 2012 the now first fully restored gray and mauve Citroën U23 could be presented to the visitors of Rétromobile. Now, visitors of the IAA Commercial Vehicles in Hanover will have the opportunity to have a look at the very special vintage Citroën. Flat screen TV’s will provide extensive documentary about the sensational discovery in Corsica up to the different stages of the restoration until today. PS: Below find the pic how the U23 bus was found.